Egypt – a country with a long history. Every year thousands of tourists come here, wanting not only to sunbathe and swim in the warm sea, but also to witness all the secrets and mysteries of this amazing country. 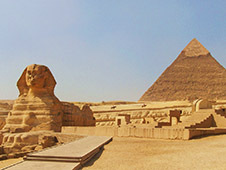 The majestic pyramids and the priceless historical monuments here side by side with modern resort areas and hotels. Car hire in Egypt is an excellent outlet for those travelers who want to get away from a visit to Egypt, the maximum impressions. Here, the main pre-acquainted with the traffic regulations in force in the country and try to observe them in all situations. In general, in Egypt, it is almost the same traffic rules that in Russia or any other country in the world. At the same time the Egyptian police very loyal and ready to close my eyes to many things. Perhaps that is why the drivers are extremely insolent behavior on the road, where there is a immutable principle - who slipped, that's right. Pay particular attention to the need to be "speed bumps" They may be located in a very unexpected places. Each protocol can be filled exclusively in Arabic, so to avoid surprises in the future, it is best to immediately request an interpreter. carriage of children without special car seats. The cost of an average fine of $ 100. At the same time the police stop the driver will not - it will record the number of the machine, and then has the right to call the station and delivery of a receipt for payment of the fine. Park the rental car in Egypt can be almost anywhere, but you must keep in mind that parking is strictly prohibited before the residences of diplomats and politicians. Road signs are not always visible, so it is best to focus on other parked cars. Given the fact that a large part of Egypt - it is a desert, it is recommended that all drivers to fill not only the full tank, but also a few canisters that should always be at hand. Gasoline in the country quite cheap, with an average cost of one liter of 0.8 $. Diesel fuel costs even cheaper - about $ 0.25 per liter. Payment in the amount of 2 to 5 pounds is carried out at the entrance to the paid section of the road, and at the exit from the highway will need to show the controller the paid receipt. I always travel alone. I get where I need and rent a car. Then I go where my heart wants. I like it very much. Once I failed to rent a car. After that, I began to use the services of online providers. This particular resource suits me best of all. I recommend it. I often come to Saudi Arabia and every time I travel around the country a lot. For this purpose, I always rent a car. It's very cheap, fast and comfortable. I always look for optimal options via this search engine. It's a great site that really helps. We went to conquer the desert and flew to Dakar. We felt like real riders at the rally. We reserved the cars via this site in advance in order to get the necessary number of cars. We were pleased with a wide choice of cars, so each of us selected the car he liked. We paid for the cars directly and without fees via this resource as well. Everything was very good. In the future I'll use this portal with great pleasure.